I've a few tax discs, the earliest is 1933 and they run through to September 1939, for a variety of cars and motorcycles. Do people collect these much? are they worth anything and is there any particular type (say the quarterly issued examples) worth more than another? Just curious, I've no plans to let any go. Tax discs and old log books seem to change hands on eBay for what I always think are ridiculous amounts of money especially as there is usually little chance of establishing a claim to the number! I've been collecting them since I was a boy and they are a very easy collection to store. Mine are in a small brown paper bag but having looked in the place I expected to find them I must have moved them to a "safer" place! 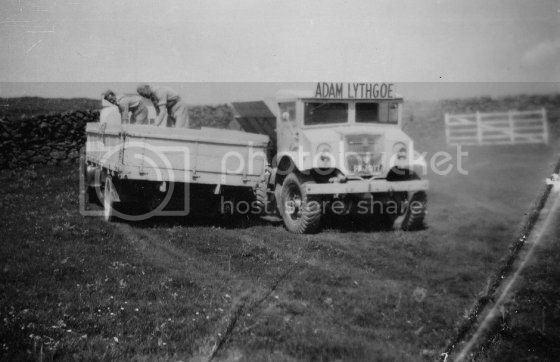 If memory serves me correctly my oldest is a rather boring post war disc from an ex-army lorry used for lime spreading like this one. Peter- that is an interesting C.M.P. truck. I see that it has full height doors, and that there are small lamps in front of the original headlamps. I have never seen either of those fitments before. There are a couple of early seventies decals still attached to one of the ute's quarterlights. Yes I know I'm ressurecting an old thread but have just found this hidden in a book. Wondering if it has any real value, also interesting to note it cost £60 in 1929. A very nice disc and certainly has a value worth preserving but I would doubt that it has the value of £60 today. The way that it has been trimmed is interesting too. I wonder if that was implied by the printing on the untrimmed sheet? That looks like an interesting disc, anything that applies to something different to the norm (a car) usually has people clamouring for it. I've no idea what it's worth but it's certainly a nice thing to have. A friend sold some later, Welsh-stamped, discs and did *very* well with them. That's a lovely piece of History, I would say its worth a fair price to a collector as its from a steam lorry. I have a few older discs, I just can't seem to part with any of the old memorabilia!